"I'm having a great time!" says BITlab coordinator Matt Zigler. Mr. Zigler came to Bullis this fall to help manage activities in the new lab, located in the Dr. Gerald L. Boarman Discovery Center which opened at the start of the school year. The Wisnosky Family Bullis Innovation & Technology Lab, or BITLab, includes a Makerspace (given by The Helmig Family) for robotics and high-tech design and a Fab Lab (given by the Snow & Teel Family). The Maker Space houses plastic and 3D resin printers, a laser cutter, sewing machine, vinyl cutter and work stations. The Fab Lab features such equipment as a bench grinder, welding station, CNC router, milling machine, ducted spray booth, vacuum former, saws (table, band, scroll and miter), drill press, and injection molding machine. The BITlab has quickly become a hub of activity throughout the school day. Several classes such as engineering, STEM Capstone and Middle School Making meet in the BITlab. The Robotics Club also works on its projects there, and students come in throughout the day to check on projects, utilize the equipment, and discuss ideas with Mr. Zigler. "Everyone is a maker," he says, echoing the motto of the Maker Movement. From low-tech tools—silk-screening machine, paper cutter, sewing kits, etc.—to higher-tech equipment, all are explored and in the process, some students have become resident experts on some of the machinery and are training and helping each other. "What may be daunting to some adults," he says, "is fascinating and opens the imagination of students. My job is to get students comfortable and then encourage them to go further and take on bigger and more complicated projects. People are inherently creative and solving problems all the time. Kindergarteners are definitely the most uninhibited. They have infinite ideas and are not hemmed in by reality and logistics. But everyone is excited to explore all the potential here. Access to tools keeps all dreams alive and takes 'no' or 'can't do it' out of the conversation." 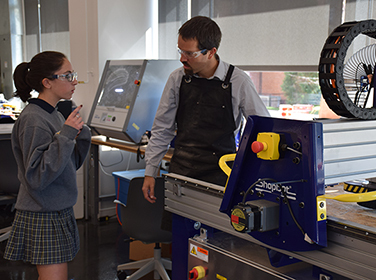 Mr. Zigler also teaches the Upper School Maker Lab class, a trimester elective. Students choose their own projects around required themes: Making to Teach, Making for Good, and Making as a Group. "Students are given wide latitude to select projects that they are interested in pursuing, so there are lots of projects happening at the same time," said Mr. Zigler. Students use the teacher, the internet, the community, and each other as resources to help create and complete their projects. Depending on what the student (or students if they choose to work as a group) decides to create, the project could last a few class periods or a few weeks. "Right now I have students working on a sign for college counseling, a half-scale portable ping-pong table, a 3D printed robotic hand, silk-screened t-shirts and 3D printed pink ribbons for breast cancer awareness... among other things," says Mr. Zigler. The biggest question Mr. Zigler gets is if a student should submit a project if it does not work out. He reminds them that the process—coming up with ideas, prototyping, creating and evaluating—is where the learning happens, and he encourages all of them to take a risk. Mr. Zigler also encourages other classes from throughout the school to conduct projects in the BITlab. "I'm like a librarian," he says, balancing the shop tools and capabilities with learning objectives and helping teachers explore new avenues to bring projects to life and explore new paths in subject matter. Early in the fall trimester, students in Ms. Allison Ewing's African American History Seminar course worked in groups to research an ancient African civilization. Using their findings, students created an artifact from that civilization using modern day technology. They then wrote a description of the artifact and explained its purpose/significance for the civilization. Students used a variety of methods and tools in the BITlab to create the artifacts. A statuette of a king, for example, came to life via the 3D scanner, CAD software, 3D printer and the spray painter. 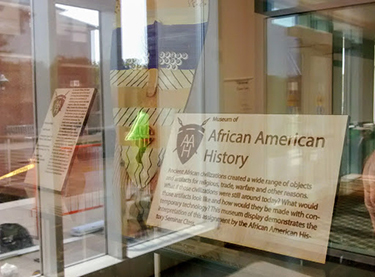 The artifacts were displayed museum-style in the BITlab window for other students to explore. "This project helped make the history more applicable to students in today's society," explained Ms. Ewing. "Students began to reconsider their understanding of history and to see how it can impact their understanding of today. "With this project, I let them know what the end goal was and in their groups they figured out how to accomplish that goal. It was a great experience for students and teacher to work together and problem-solve together." Ms. Maris Hawkins had an idea to explain the artwork of Frida Kahlo for her Spanish students. "I thought using selfies would be fun, but wanted to create something in addition. 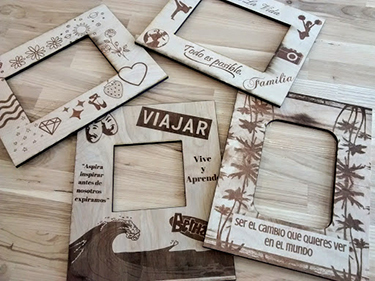 Mr. Zigler had the idea of having students highlight their interests in laser-cut wood frames. Then in class, students presented their frame in Spanish and answered questions. It was a great way to show that the BITlab and these kinds of projects could be made by anyone, not just students who enjoy engineering. The process took about one class, so it wasn't a huge investment of time to get a wonderful product. My students were excited to use the BITLab and many other students were impressed with the quality of work that they got from it." 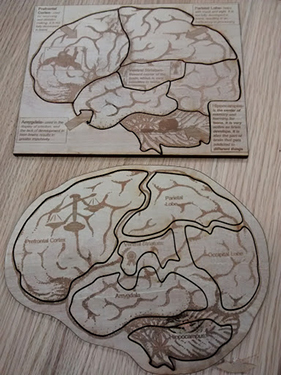 Other recent projects include a giant solar system model with the Astronomy class; shop-bot cue wood and engraving for scenery pieces for the fall play, "Medea"; teenage brain puzzles demonstrating significant differences in teenage brain development for Health; foldable boxes to measure volume with Geometry; vacuum-formed candy Molds with Food Science; and poster-sized Propaganda Posts with Public Speaking students. The Middle School Impact class also worked with Mr. Zigler to design a possible trophy for the Middle School administrators to award to the grade each trimester that best represents Bullis core values. Mr. Zigler brings a B.A. in fine arts and a master's in painting to the role. Not exactly the background one might expect for BITlab coordinator. "I got into this at my former school when no one was using a 3D printer that had been donated. I figured it out, started playing around with it, and quickly discovered the creatively infinite universe that opens up through this equipment!" "I believe we learn best through direct experience," Mr. Zigler continues. "I can tell you how something was made, but actually making something (or taking something apart) is not only a more memorable experience, it helps students truly understand how its parts function and interact to make a whole. Direct experience also inspires us to ask questions and find solutions to go beyond ideas and knowledge that has already been established. "A Makerspace is a place where a creative individual can find the tools to build almost anything. Learning here goes beyond just learning how to use those tools. It's learning how to create new things, solve problems creatively and design objects and experiences that can change lives. This is learning that is truly meaningful and impactful."